We are the East Whittier Education Association (eWEa). We represent the teachers, psychologists, counselors, and nurses in the East Whittier City School District. We work hard so students and our members have the opportunities and resources to succeed. We don't want you to join. We want you to belong. 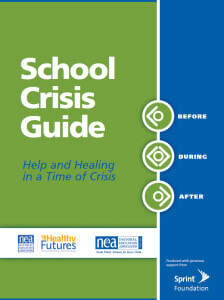 NEA Healthy Futures has created The School Crises Guide with ideas, tips, tools, and resources that spur effective leadership and crisis management. Created by educators for educators, this guide can help keep schools safe before, during, and after a crises.